Twenty one aspiring young scientists from the South Pacific including PNG have been given the opportunity to undergo an intensive short course training program in Marine Science here at the University of PNG. Nautilus Minerals is sponsoring the training of these students. Nautilus Minerals and the Duke University have collaborated on similar partnerships since 2007. These partnerships have seen four students from PNG attend the Duke University to learn state-of-the-art marine techniques. This time, Nautilus and Duke University have partnered with UPNG to bring the training to PNG. The twenty one participants have been taught about the biology of invertebrates that live in the marine environment and will also gain some insights into the seafloor environment and sampling procedures. 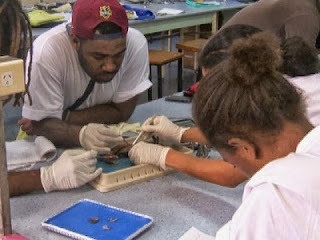 Nautilus’ PNG Country Manager Mel Togolo said the scholarships have been awarded to help build the students capacity and develop practical skills in marine science techniques. Mr Togolo says this is a milestone achievement in marine science education not only for PNG but for the wider South Pacific community. Nautilus Mineral is engaged through its Solwara 1 project in Deep Sea Mining in the New Ireland Province. It is anticipated that by the end of the course, participants will have attained skills to help increase their capacity in monitoring and conducting environmental studies and assessments in the marine environment.